Pigs infected with porcine reproductive and respiratory syndrome virus (PRRSv) showed a marked reduction in the functional ability of their alveolar macrophages to kill Haemophilus parasuis and produce superoxide anion. An in-vitro and ex-vivo study was conducted in four-week-old piglets infected (or not) with PRRSv. Their Porcine Alveolar Macrophages (PAM) were used to evaluate their phagocytosis and killing activity against H. parasuis. A reduction in phagocytosis was seen in PAMs after seven days of PRRSv infection. 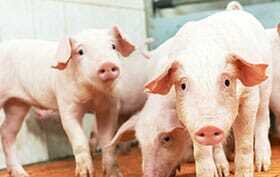 PAMs from PRRSV infected pigs had a lower ability to kill H. parasuis. This study was performed in order to characterise the interaction between PRRSv and Haemophilus parasuis in Porcine Alveolar Macrophages (PAMs). Nineteen four- to five-week-old piglets were selected (PRRSV-negative and ADV-negative). Four piglets were euthanised and their PAMs were used for the in-vitro studies: PAMS were inoculated with PRRSv and then exposed to Haemophilus parasuis in order to determine the phagocytosis capacity of these PAM. Fifteen piglets were used for the ex-vivo studies; nine were infected with PRRSv and six remained as controls. The animals were euthanised at different times (6, 12, 24, 168, and 216 hours post infection) and their PAMs collected for the rest of the study: PAMs were exposed to Haemophilus parasuis and phagocytosis and killing capacity was determined. There was a reduction in bacterial uptake (phagocytosis) in PAMs collected after 168 hours (7 days) of infection, which may suggest that phagocytic function may change with time following virus infection. The problem is that the time intervals were too short at the beginning and then from day 1 until day there were no samplings. When intracellular survival was evaluated, after 30 minutes, there were higher numbers of H. parasuis in PAMs collected from piglets 168 and 216 hours post-infection as compared to PAMs from non-infected controls. This indicated that PRRSV-infected pigs had a marked decrease in the functional ability of their PAMs to kill H. parasuis and produce superoxide anion. It can be suggested that in the later stages of infection (168 and 216 hours), the transitional decrease in superoxide production by AM may create a more permissive environment for bacterial colonisation. This effect seems to be reverted after four weeks of infection, as mentioned in the literature. G. I. Solano, E. Bautista, T.W. Molitor, J. Segales and C. Pijoan 1998. Effect of porcine reproductive and respiratory syndrome virus infection on the clearance of Haemophilus parasuis by porcine alveolar macrophages. Can. J. Vet. Res. Oct. 1998; 62(4):251-256.